Following the success of my cranberry pumpkin bread the other day (it was sooo good! ), I had some leftover pumpkin puree sitting in the fridge. For a while I was at a loss as what to make with it, there are just too many tempting options – pumpkin cookies, pumpkin pancakes, pumpkin pie, pumpkin ice cream, pumpkin cake, pumpkin muffins…are just some of the things that crossed my mind (while I salivated), but then I thought of something that I hadn’t baked in far too long – cinnamon rolls! 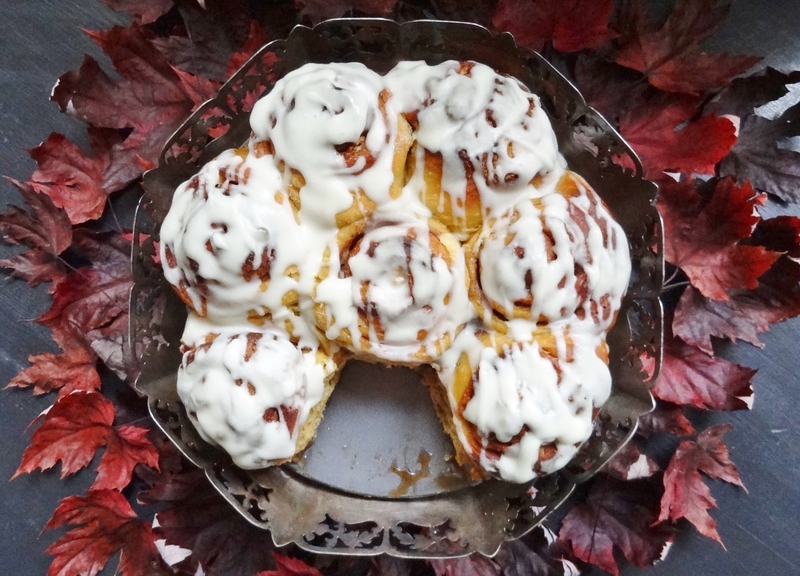 Cinnamon rolls (and other kinds of sweet, sticky yeast bun) are one of my favourite baked goods, and just the kind of thing you want to eat on chilly autumn mornings. 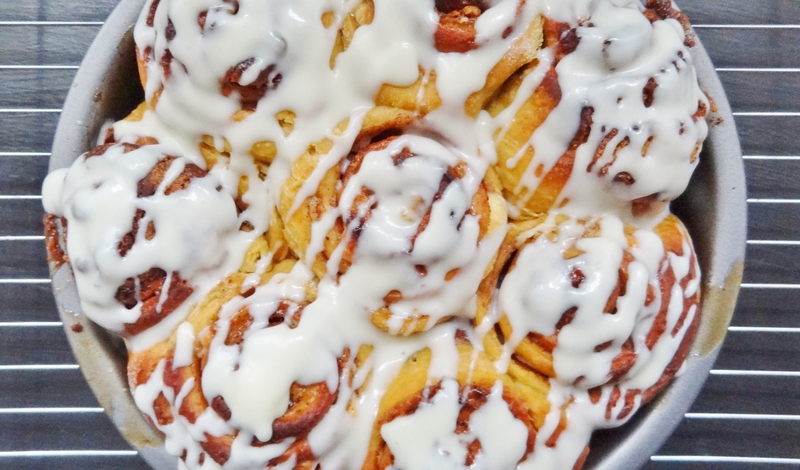 But these are not just cinnamon rolls, these are pumpkin cinnamon rolls, filled with gooey brown sugar, butter, spices and chunks of white chocolate. And as if that isn’t enough sweet, sticky goo, I coated them (liberally) with a so-good-I-could-drink-it-from-the-bowl white chocolate and cream cheese glaze. These are worth getting sticky fingers for! The recipe below makes a fairly generous quantity of glaze (in the photos I hadn’t used all of it), so if you prefer more of a light drizzle than a drenching you may want to halve the quantities (it is really good though…). And this is one of the very few occasions where I will concede that it is ok to use light cream cheese if you wish – icing usually ends up too runny when reduced fat cream cheese is used, but runny is what we are going for here. I do still recommend using Philadelphia though. These are a great thing to make ahead, if you want them for breakfast or brunch you can make the dough and assemble them in the evening, leave them in the fridge overnight then let them rise in a warm place for 1-1 1/2 hours in the morning then bake, glaze and devour. 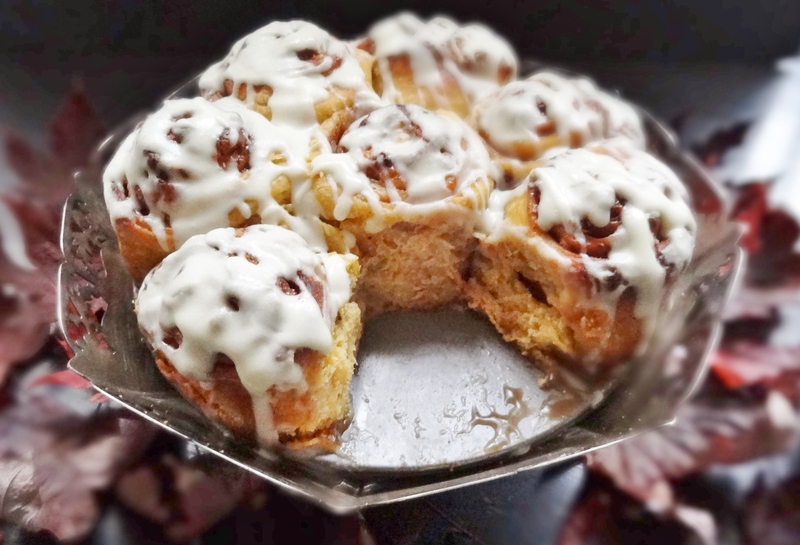 I’ve made a relatively small batch of rolls here, six large or eight small, as I find that most cinnamon roll recipes yield far too many for just two people, but it is easy to double the quantities to make two pans worth if you want. It is fine to use either canned or homemade pumpkin puree for these, to make your own simply heat the oven to 190°C/375°F/gas mark 5, slice a small pumpkin or butternut squash in half lengthwise and scoop out the seeds, place face down in a roasting tin and bake for about 45 minutes until fork tender. Remove from the oven and allow to cool a little then peel off the skin and puree the flesh in a food processor/with a hand blender/potato ricer until smooth. Don’t use the large carving pumpkins as they are stringy and don’t have much flavour, any variety of small pumpkin or squash is fine, I use butternut squash as it is easy to get hold of and is less stringy than pumpkin (I also read that most canned pumpkin puree is actually butternut squash anyway). 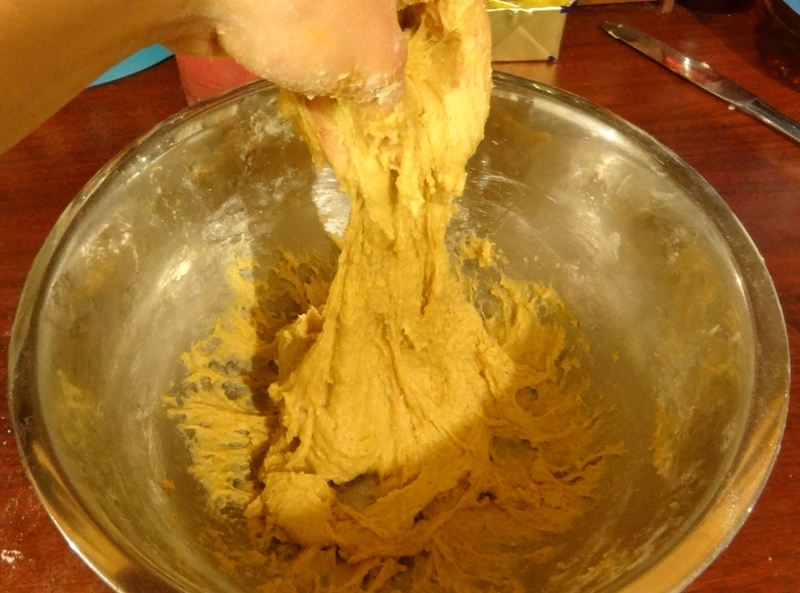 Place the flour in a large bowl, add the yeast to one side and the salt, sugar and spices to the other, add the pumpkin puree, egg, melted butter and milk and mix it all together into a sticky dough ( it will be very sticky!). Knead for 5-10 minutes, this is best done using a stand mixer but can be done by hand; the best way to knead a wet dough by hand is to pull sections of the dough up to stretch them. Scrape the mixture into a lightly oiled bowl and cover with clingfilm, set aside to rise for 1-2 hours until pretty much doubled in size, meanwhile, line the base of a 20cm round cake tin with greaseproof paper and stir together the sugar and spices for the filling. 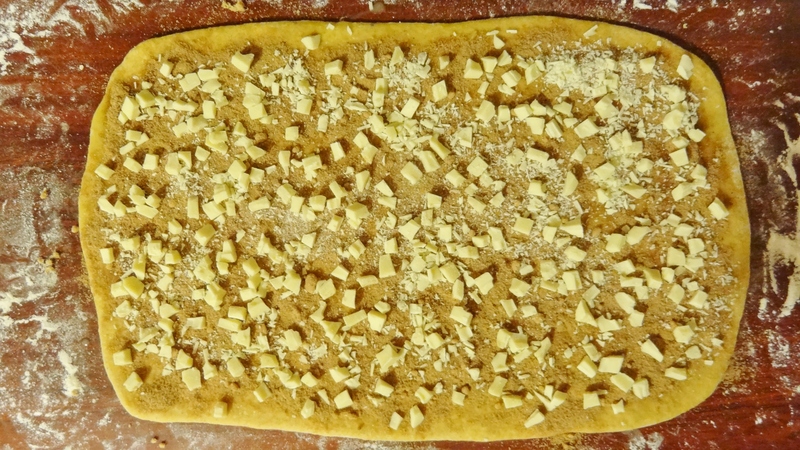 When the dough is risen, turn it out onto a well-floured surface and fold it in on itself a couple of times then roll it out into an approximately 25x35cm rectangle. Brush the melted butter all over the surface then sprinkle over the sugar and spice mixture and scatter over the chocolate. 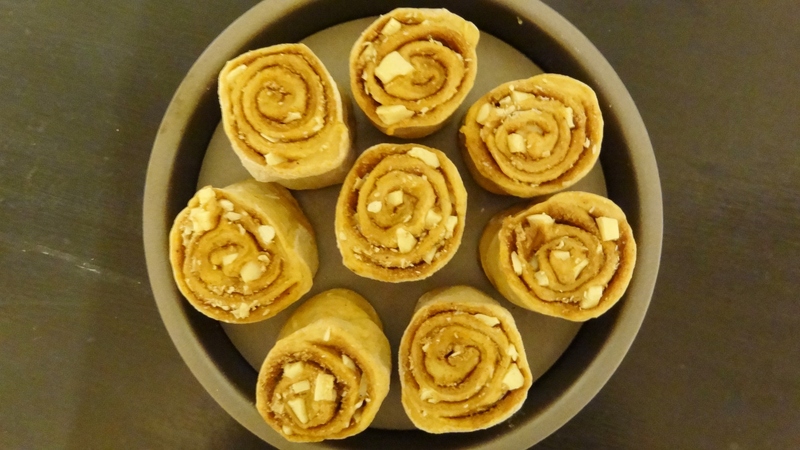 Roll the dough up into a tight spiral. Using a very sharp knife, slice the roll into 6-8 pieces, arrange them in the prepared tin then loosely cover, you don’t want the cover to touch the rolls, I like to put the pan inside a clean plastic bag. At this point you can either let the rolls rise for about an hour in a warm place until puffy, then bake, or place them in the fridge overnight, then the following morning take them out of the fridge and let them rise for about 1 and a half hours at room temperature before baking. 15 minutes before baking, preheat the oven to 180°C/350°F/gas mark 4, place the tin in the centre of the oven and bake for 25 minutes until they are puffed and golden and smell amazing, I had to cover mine with tin foil after about 15 minutes – keep an eye on them. When they are baked, place the tin on a wire rack while you make the glaze. Melt the white chocolate, either in a heatproof bowl over a pan of simmering water (don’t let the base of the bowl touch the water), or in 10 second bursts in the microwave. Lightly beat the cream cheese until smooth then stir in the melted chocolate, add the milk until the glaze is a drizzling consistency then drizzle/pour/slather it over the rolls and have at them! 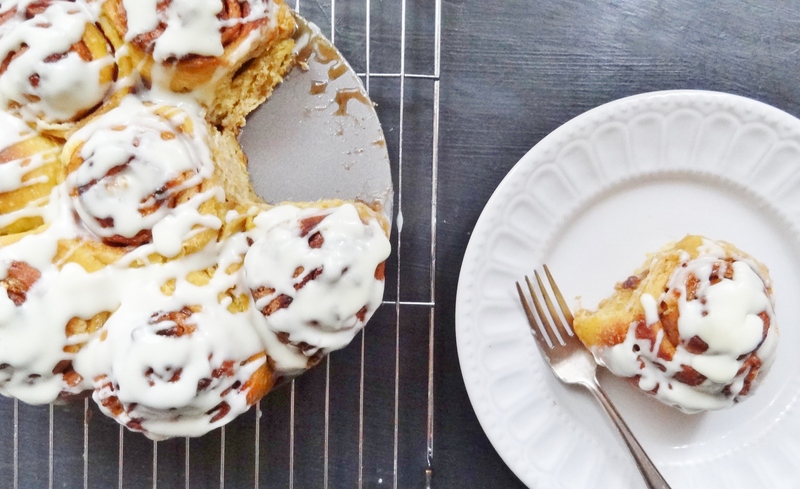 I love pumpkin, and using it in these cinnamon rolls is just so decadent! Pinned! These look so very good! Inspiring! Oh my goodness these look like heaven! 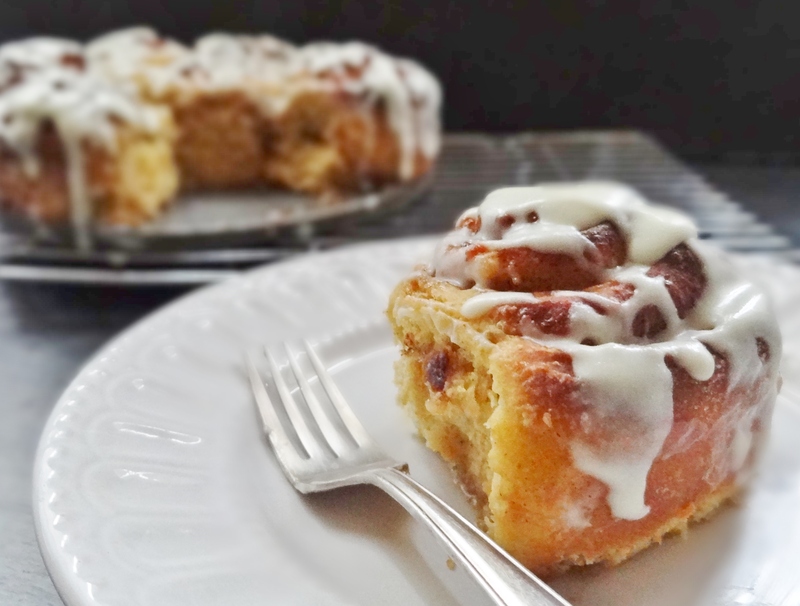 I love cinnamon rolls and they are on my list of things to try and make gluten and dairy free! A bit of a challenge but one I am up for, perhaps for Christmas breakfast!! Thanks for sharing. That sounds like quite a challenge indeed! Sweet rolls are a huge favorite of mine. I like a heavy drizzle too!